If there’s one universal truth in the restaurant industry, it’s this: consumers today are almost impossible to figure out. They want global flavors as well as comfort classics; they want better service at a cheaper price—and they want all of that right now. Fortunately for operators, beverages are an area of foodservice that’s experiencing solid growth—so much so, in fact, that seven out of 10 consumers purchase beverages away from home twice a week or more, according to Technomic. By implementing a beverage program that’s on-trend, operators can cater to discerning consumers while maximizing sales at the same time. One of the most important trends currently influencing both commercial and non-commercial foodservice right now is customization. Consumers today—particularly millennials—view menu customization options as a need rather than a luxury, according to Food Genius. Offering consumers a chance to create beverages “their way”—think flavored syrups, mix-ins or flavor mash-ups—can generate excitement. Operators can easily offer a customizable beverage program by installing a fountain dispenser such as the Coca-Cola Freestyle. This innovative fountain dispensing platform offers consumers more than 100 drink choices and unique flavor combinations, such as soft drinks, sparkling beverages, flavored waters, sports drinks, lemonades and teas—including more than 70 low and no-calorie and more than 90 caffeine-free beverages. In addition to customizable beverages, Coca-Cola Freestyle provides consumers with a unique platform and ordering experience. Consumers interact directly with the innovative touchscreen to select from beverage and flavor options, and they’re able to dispense their own combinations on the spot. Moreover, consumers are able to customize beverages even more easily with the newly-enhanced Coca-Cola Freestyle mobile app. Through the app’s “Create Your Own Mix” feature, users can choose from more than 100 drink options to create a custom mix of their own, and then, for the first time, use their smartphones to interact with the dispensers at participating locations and pour on the spot. For operators, this innovation can translate to more beverages sold—and a healthier bottom line. The mixology movement and craft-cocktail craze has become one of the top beverage trends in the last few years. But what about beverage innovation outside of the bar? 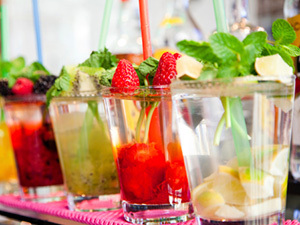 Many operators have started menuing “mocktails,” or non-alcoholic cocktails, and other specialty beverages such as smoothies, craft teas and sparkling lemonades as an alternative for health-conscious consumers or consumers who can’t or don’t drink alcohol. But mocktails and specialty beverages aren’t limited to just non-alcoholic versions of popular cocktails, such as strawberry daiquiris or Bloody Marys. Operators are using fruit, spices and herbs such as rosemary, basil and ginger to give their signature beverages menus a boost. For another easy way to menu specialty beverages, try infusing soft drinks, flavored waters or even tea with different vinegars—the acid in vinegar offsets sweetness, and it gives mocktails a surprising kick. Another trend that’s making major waves in commercial and non-commercial foodservice this year is the prevalence of snacking. Half of today’s consumers report eating snacks at least twice per day, and a third of consumers say they snack more frequently today than they did two years ago, according to Technomic’s 2014 Snacking Occasion Consumer Trend Report. And consumers aren’t just eating snacks between meals. Technomic also finds that 45 percent of consumers replace one or two daily meals with a snack. Additionally, a snack’s portability is key—60 percent of consumers say that portability is important or extremely important to them when choosing a snack. This emphasis on snacking provides operators with a great opportunity to use beverages as a way to increase sales. Specialty beverages such as smoothies, juices and shakes as well as coffee-based drinks such as lattes and cappuccinos are not only refreshing and satisfying as snacks, but they’re also portable and easy for consumers to grab while on the go. As a bonus, many specialty beverages work well as better-for-you, nutritious snack options—something that half of consumers look for when choosing a snack.